This free ESL lesson plan is the second of three lessons on the theme of film. 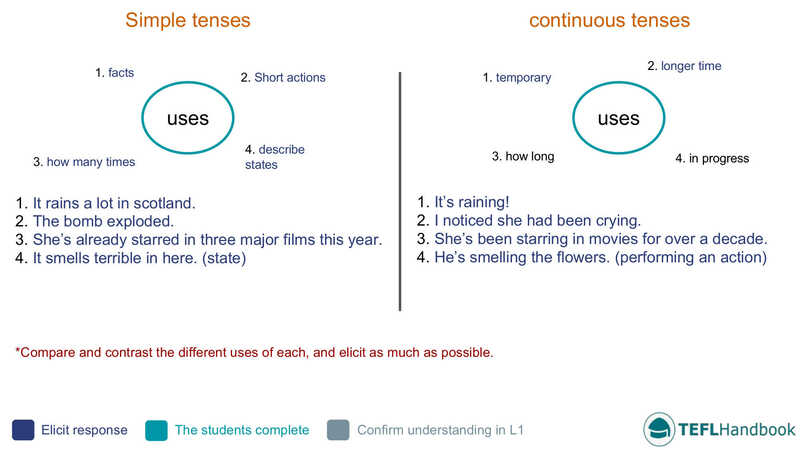 It contains activities, games and other teaching resources that can be used to teach upper-intermediate level students the correct functional use of the simple and continuous tenses. For this activity, students will work in pairs to create grammatically correct sentences related to film in both the continuous and simple tenses. Divide the students into pairs or groups of three and have them write two sentences for each prompt (Continuous and simple). Each sentence should be related to the theme of this unit in some way. Learners at this level often confuse the meaning of some of these words. Confirm the definition of each word before they begin, and encourage them to use dictionaries or smartphones if they are available. Students have to make questions and interview each other in a variety of tenses. They will then work individually to make interview questions that contain the specified verb and tense. When the students are ready with their questions, they can begin the interviews. Encourage them to ask follow-up questions and have fast finishers report on what they learned about their classmate. Your students have to read and summarise an online movie review of one of their favourite films. Players design and draw a film poster on the board until their teammates guess the correct answer. Start by dividing the class into two teams. On each turn, give the student in play a movie title. That student must then design a movie poster(minus the text of course). Their teammates earn a point when they guess it correctly. To make it more competitive, split the board into three parts, set a stopwatch for two minutes and give the student with the marker three posters to design. The team with the best time wins. 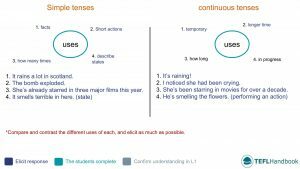 If you found these resources helpful, our next free lesson plan in this course is on the future perfect and continuous tenses. Also, be sure to check out our full list of upper-intermediate ESL lesson plans. For other levels, have a look at our complete selection of EFL - ESL lesson plans.